WIM Yuanling Yuan visited the club to challenge all comers. In all, twenty players from unrateds to 1800s, came to challenger her. 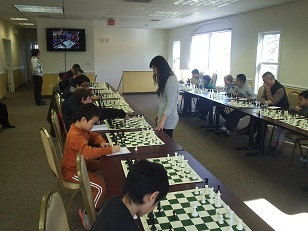 The simul stretched on over two hours as the players put up great resistance. However, the extremely focused Yuan made her way around making her moves with great confidence. Despite some close calls, in the end nobody was able to top her and Yuan scored a very impressive 20 wins – 0 draws – 0 losses!